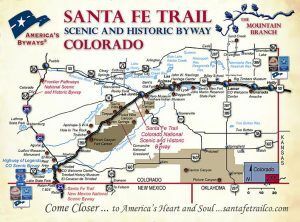 The Santa Fe Trail is significant to the history of what became the State of Colorado. When legal trade began in 1821, over half of the land now comprising Colorado was under Mexican ownership; the other half was unorganized territory. 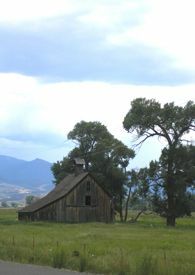 Southeastern Colorado’s dramatic landscape inspired the name for one of the main routes of the trail; the Mountain Route became especially important as the railroads moved into the state. 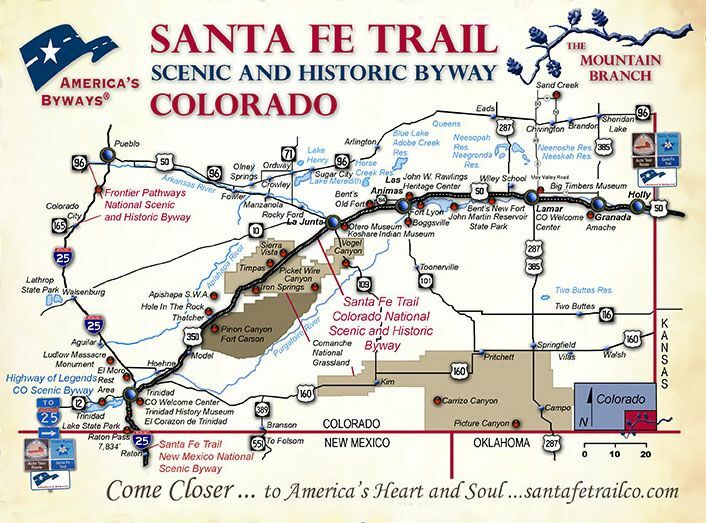 Both the Mountain and Cimarron Routes of the Santa Fe Trail crossed the southeastern corner of Colorado, though the Cimarron Route traversed approximately only 14 miles of Baca County. In contrast, the Colorado segment of the Mountain Route was much longer, totaling 181 miles. This route crossed present Prowers, Bent, Otero, and Las Animas counties before entering New Mexico. 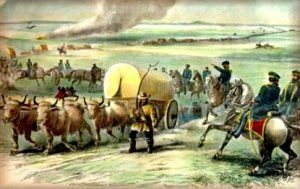 When trade between Missouri and Santa Fe began in 1821, the area now comprising the State of Colorado was claimed by several groups. Prior to the arrival of white settlers, the lands in what is now eastern Colorado were claimed by at least four different Indian tribes. The Northern Cheyenne and Northern Arapaho were located in the northeastern portion of the future state; the Kiowa, Comanche, and Jicarilla Apache/Apache extended into the southeastern portion. With the Louisiana Purchase in 1803, a vast area that included what is now most of eastern Colorado was claimed by the United States. The Louisiana Purchase did not specify the southwestern boundary with Spain, so in 1819, the Adams-Onís Treaty, established the boundary between the United States and Spain as the right (west) bank of the Sabine River, the right (south) bank of the Red River, the 100th meridian, the right (south) bank of the Arkansas River, a line from the headwaters of the Arkansas River to the 42nd parallel, and then west on this parallel to the Pacific Ocean. The Arkansas River divided eastern Colorado with the land north of the river belonging to the United States and lands south of the Arkansas River to Spain. Following Mexican independence from Spain in 1821, the Arkansas River formed the border between US and Mexico in the portion of the future State of Colorado lying east of the continental divide until 1848. The area now known as Colorado went through various claim and boundary phases before becoming a state in 1876. When Texas became an independent republic in 1836, it claimed a narrow strip of mountain territory extending northward through Colorado to the 42nd parallel. During the early 1840s, Mexico granted lands to some of its wealthy citizens in the San Luis Valley, south of the Arkansas Valley and within the Rocky Mountains, hoping to secure claims against Texas or the United States. Through the Treaty of Guadalupe-Hidalgo following the Mexican-American War in 1848, Mexico ceded to the United States most of that portion of Colorado that had not already been acquired through the Louisiana Purchase. Between 1848 and 1861 the border between New Mexico Territory and Colorado was an east-west line just south of Bent’s Fort. In 1850, the Federal Government purchased Texas’ claims in Colorado. On May 30, 1854, President Franklin Pierce signed the Kansas-Nebraska Act into law. The act created the territories of Kansas and Nebraska. This act defined the boundaries of Kansas Territory as the Missouri border to the east, the 40th parallel to the north, the 37th parallel to the south, and the summit of the Rocky Mountains to the west. Lands in what is now eastern Colorado were part of Kansas Territory until the 1859 Wyandotte Constitutional Convention placed the western boundary of Kansas Territory a few miles west of the 102nd meridian – 18 months before Kansas statehood. The discovery of gold on the slopes of the Colorado Rockies was the occasion for a sudden immigration into a deserted stretch of mountains and plains. Early in 1859, gold was found by George A. Jackson along Chicago Creek on the present site of Idaho Springs. On May 6th of the same year, John Gregory made the famous gold-lode strike on North Clear Creek, stimulating a rush of prospectors, who established the camps of Blackhawk, Central City, and Nevadaville. Rich discoveries caused a stampede of miners to California Gulch on the present site of Leadville in 1860. In the first three years after the Jackson and Gregory discoveries, 100,000 people made the pilgrimage to the diggings. Half of them reached the mountains, and half of those who arrived survived the disappointments and decided to settle there. This small population of prospectors and settlers, totaling only 25,371 in 1861, became a community, then a territory, and 15 years later, a state. Before Colorado Territory was established, it included portions of the Nebraska, Utah, Kansas, and New Mexico territories. Along with admitting the state of Kansas, Congress finally established Colorado’s current boundaries, forming Colorado Territory in 1861. In 1876, Colorado was finally admitted to the Union as the 38th state.